In early 2015, members of FCCPA met a Trammell descendant in Vienna. By using old maps and neighbors descriptions, we were able to locate the Israel Trammell Family Cemetery situated at the intersection of the back lots of two homes on Galloping Way. The cemetery has become overgrown. We were able to locate Israel’s gravestone and foot stone and several field stones, which appeared to mark graves. Two old wire fences lined one edge of the cemetery. 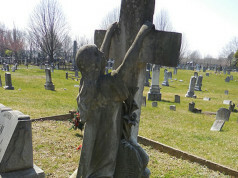 The cemetery is about 14 square yards in size and rests on a knoll about 150 feet from the street. In April 2015, family and FCCPA members trimmed and cleared brush. Large downed trees were cut up and stacked. During the clean up, several field stone grave markers were located. According to the 1860 census, Israel Trammell (42) and his wife Clarissa (35) and eight children lived on a farm of @ 100 acres. They had horses, oxen, milk cows, cattle and hogs. They raised Indian corn, oats, rye, hay, buckwheat and Irish potatoes. They also owned one slave. On May 22, 1893 Israel died at the age of 73 and was buried on his property. The other burials, which are marked by field stones, are unknown. 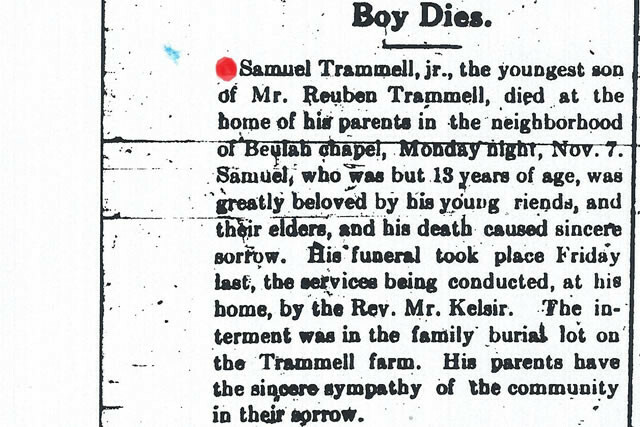 On November 18, 1921 the Fairfax Herald newspaper reported the death of Samuel Trammell (13), Israel’s grandson. The article stated that Samuel was buried on the family farm. 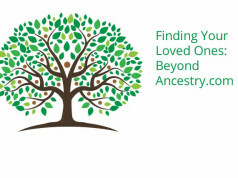 A Trammell descendant has researched the family history and has compiled a list of possible interments in the Trammell cemetery. On August 21, 1888, Israel and Clarissa Trammell convey 30 acres to Zella and Samuel Trammell. On November 16, 1909, they sell this property and exclude the “14 sq. yd” cemetery. Other parcels are also conveyed to the children of Israel Trammell. Israel Trammell, b. 1818, d. May 22, 1893. Lewis Benjamin (LB) Trammell (son), b. 1847, d. 1878 [predeceased his parents]. 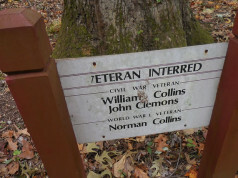 Benjamin and his wife, Viola, are listed on the Commins’ marker in Flint Hill, but this could be a memorial marker since Benjamin and Viola were the first in the family to die on both sides. Clarissa Ann Lanham, wife of Israel, b. 1824, d. May 19, 1909. Undertaker expense was $75.00 which appears low compared to others in public cemeteries. 2 young children of Zella and Samuel Trammell that were born and died between 1900 and 1910. They owned the property so it’s quite likely. Samuel Leslie Trammell, son of Reuben, predeceased is parents, b. Aug 1898, d. Nov 1921.